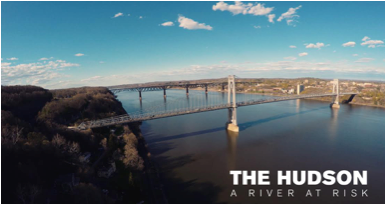 The Hudson: A River at Risk is a series of short films by Jon Bowermaster that chronicles three time-sensitive issues affecting our Hudson River – Crude Oil rail transport, building the new Tappan Zee Bridge, and Indian Point – this screening will provide a view of our Hudson that document cause for alarm & exposes the Hudson’s fragility. While the world is in agreement that the Hudson River, America’s ‘First River,’ is far cleaner than it was twenty and thirty years ago, it still wrestles with a variety of environmental ills and potential catastrophes. During the past year I traveled up and down the river by boat and kayak, from Troy to Manhattan and back, taking a look at a handful of issues facing the river, its historic valley and 20 million neighbors. Specifically I took a close-up look at three distinct risks: The so-called “bomb trains” that carry a highly explosive mix of crude oil and gas from the shale fields of North Dakota into the port of Albany and down the river into New Jersey; the 53-year-old nuclear power plant at Indian Point, which continues to operate even as its infrastructure ages; and the rebuilding of the Tappan Zee Bridge, currently the biggest construction project in North American, with a potential to create serious environmental harm if not closely monitored. State Senator David Carlucci represents New York’s the 38th district, which includes all of Rockland County and the Town of Ossining. He is a lifetime resident of the Hudson Valley and a Cornell University graduate. He’s an outspoken critic of the Indian Point Energy Center and has called for exploring new options for replacing the aging nuclear plant. Prior to being elected State Senator, Carlucci served as Clerk for the Town of Clarkstown. He and his family reside in Rockland County. As an attorney and educator, Paul Gallay has worked in the environmental movement since 1987, when he went to work for the New York State Attorney General. In 1990, he began a 10-year stint at New York’s Department of Environmental Conservation, where he brought hundreds of corporate and government polluters to justice. Paul subsequently spent a decade in the land conservation movement before becoming Riverkeeper’s President in 2010. Paul is a graduate of Williams College and Columbia Law School. Greene has been the Environmental Action Director at Clearwater for 20 years. Prior to that, she was the Recycling Coordinator/Educator for the Ulster County Resource Recovery Agency and a registered critical care nurse. A lifelong community activist, Manna teaches communities how to integrate environmental preservation, economic prosperity, and social equity using effective communication. Greene also serves as an Ulster County Legislator. Dr. Spector leads Scenic Hudson’s work on climate change and adaptation, providing scientific guidance to ensure that Scenic Hudson’s land acquisitions and stewardship practices benefit the region’s most biologically important sites and helping Hudson River Estuary’s habitats and people adapt to climate change. Dr. Spector is also an adjunct assistant professor at Columbia University and a Research Associate at the American Museum of Natural History.